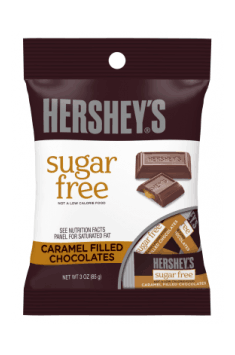 Hershey’s Sugar Free Caramel Filled Chocolates are chocolates with low carbohydrate content made by the famous sweets producer from the USA. The chocolates are sweetened with maltitol, which is why their calorific value is much lower than in normal sweets. A container contains 10 individually packed chocolates. Maltitol is a chemical compound classified as polyol (polyalcohol); it occurs naturally in some plants, i.a. figs. Maltitol is about 10‒40% less sweet than saccharose, is much less caloric, does not cause dental caries and has low glycemic index (its IG is 35, while the saccharose’s is 60). What is interesting, in the presence of fats the IG of this compound declines, the IG of chocolate sweetened with maltitol is 28. Maltitol is then a good alternative to white sugar. Unlike artificial sweeteners (like aspartame), it has no bitter aftertaste. Chocolates sweetened with maltitol can be present in a healthy diet. Thanks to low calorific value, they are a good alternative to regular sweets. They will not ruin the diet and, eaten in moderation, will not negatively affect the body shape. Glycemic index (IG) is a value describing the influence of food on the concentration of glucose in blood (postprandial glycaemia). Products with high IG cause a rapid increase in glucose level and then its rapid decline caused by insulin. In turn, products with low IG (under 50) cause smaller fluctuations in glycaemia. Sweets sweetened with maltitol do not cause rapid fluctuation in the levels of glucose and insulin, in contrary to traditional sweets containing saccharose. This is particularly important for people with insulin resistance or PCOS. The meta-analyses demonstrate that a low-IG diet can reduce the risk of obesity, diabetes and some cardiovascular diseases. To sum it all up, Hershey’s Sugar Free Caramel Filled Chocolates is a low-calorie snack of great milk chocolate and caramel flavour. It is perfect for everyone who takes care of his body shape. Eat 1 serving a day. Low-sugar products are the best choice for everyone who takes care of health and body shape. The product is perfect both as a single snack or an addition to i.e. oatmeal. Maltitol, Maltitol Syrup, Cocoa Butter, Chocolate Polydextrose, Cream (milk), Polyglucitol, contains 2% or less of: Milk Fat, Calcium Carbonate, Palm Kernel Oil, Cocoa Processed with Alkali, Milk Protein Isolate, Maltodextrin, Sodium Caseinate (milk), Natural and Artificial Flavor, Lecithin (soy), Dairy Butter (milk), Glycerin, PGPR, Emulsifier, Salt, Disodium Phosphate, Potassium Sorbate, Preservative, Carrageenan.